GoldenDict is a virtual dictionary. It has many useful features and a search function that makes it powerful. With its user-friendly interface, it is so simple that anyone can use. GoldenDict is a software acting dictionary. It helps to have the meaning of a given word in sentences or illustrations. It can also do translations online words or phrases. GoldenDict also has a speech function which allows users to control the pronunciation of a word. Indeed, it supports looking and listening to pronunciations from forvo.com. WebKit GoldenDict is used to supplement the information supplied. Indeed, WebKit is a software library, and allows a more accurate representation of the item sought, such as images, links, etc. GoldenDict supports a wide range of file formats dictionary. These include, among others, BGL, IFO, DICT, IDX, SYN, DSL, and LSA. In addition, this software can be launched as online mode and offline. 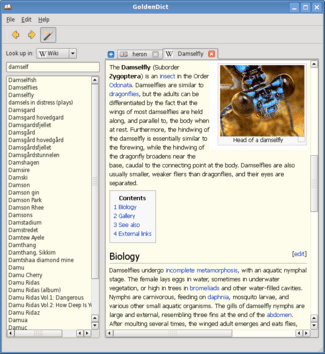 In fact, you can read the interface of free dictionaries as Wikipedia, Littre, WordNet, Webster, etc. It is downloadable for free. It supports global hotkeys and supports Unicode. ”A commercial mobile version is now available for Android devices”. It is available for Mac and Linux. Latest update on June 9, 2016 at 09:07 AM.